Pammy Blogs Beauty: Scunci 2013 Hair Trend Accessories Collection: Review and Giveaway!!! Enter to win! Scunci 2013 Hair Trend Accessories Collection: Review and Giveaway!!! Enter to win! With my long hair, I am always looking for ways to freshen or change-up my look! Often, I just want to pull it back to get it off my face or neck. My standard ponytail can get boring on its own. That is why I love to freshen things up with cute hair accessories! 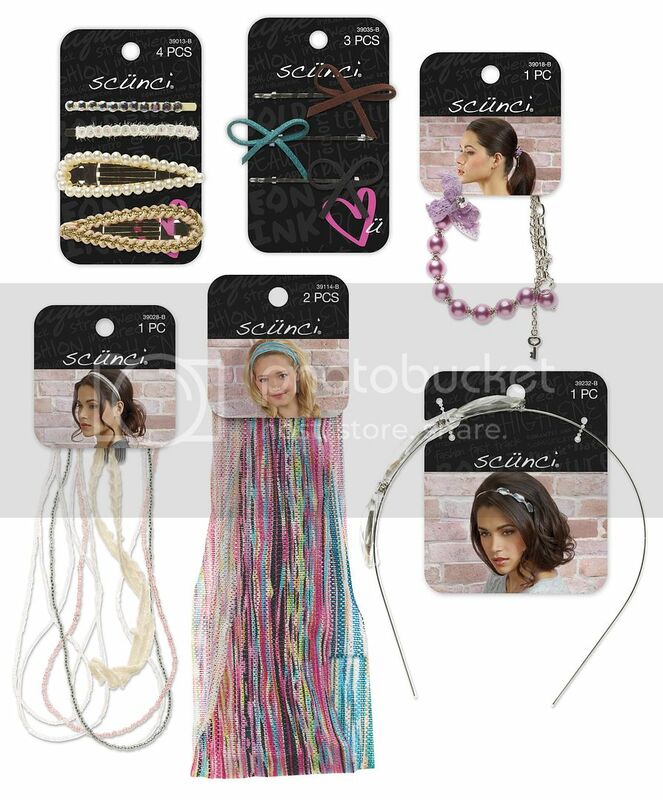 Scunci has some super cute and affordable hair accessories available right at the drugstore! If you’re the girl who has that classic style with a bit of edge, the girl who loves feminine looks, lives by her own rules or who is high energy, then these were made for you! Whether your style is natural and urban, romantic and retro, bohemian and eclectic, or bold and bright, scünci has got you covered. The new trend collection includes a variety of bejeweled and colorful bobby pins, hair bands, barrettes, hair ties, and claw clips. Available at drug and mass retailers for an average retail price of $2.99-$5.99. Wide Loose Knit Striped Headwrap: Nothing beats a headband for a simple and quick hair-do! Now, these loose knit headwraps are just that...loose. On their own, they are not tight enough to hold my hair back well. So, I need to use a tighter small headband underneath and then use the headwrap on top for style. They are super cute though. So, they are worth double headbanding for the cute look. I just wish that they were tight enough to wear on their own. Large Jewel Headband: While this headband is not my style for everyday, it is a cute way to bling-up your hair for a special occasion or a night out. It looks cute added to my hair when it is down or up! What do you have your eye on from this Scunci collection? The Prize: One Scunci Hair Trend item of the winner's choice. Prize is shipped directly to the winners by Scunci. Pammy Blogs Beauty is not responsible for items lost or damaged in mail/transit. Prize fulfillment is through Scunci. Prize is not redeemable for cash. Contest runs from Sept 12th -Oct 4th, 2013. Winners have 48 hours to respond to winning email from Pammy Blogs Beauty or a new winner/winners will be selected. 3. Answer question in comment form below: What Scunci hair trend item would you choose if you won? I would choose the large jewel headband. Super pretty! I'd choose the Pearl Ponytailer with Chains! Quick way to make your hair look cute! I would like to try the head wrap. I have tried them before without much success, but I love your idea of another, tighter band underneath! I would pick the Pearl snap clips. I would choose the knit color stripe head wrap. So useful and pretty!